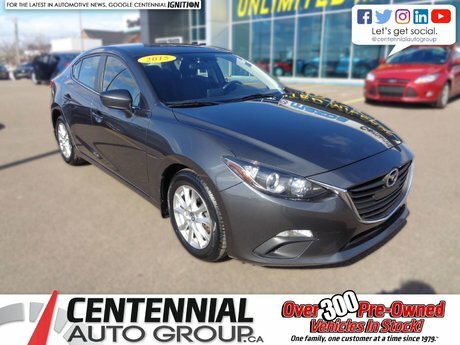 This is a top-tier pre-owned value, a super-clean 2013 Mazda 3 Sport in GS trim with the more powerful and more fuel efficient SkyActiv engine. The manual transmission is prototypical Mazda – a slick-shifting short-throw shifter with an easily modulated clutch. Beyond the excellent cargo-carrying versatility of the hatchback, the Mazda 3 GS also includes heated seats, Bluetooth, cruise control, a leather-wrapped steering wheel, keyless entry, and air conditioning. Thank you for your interest in this Mazda 3 Sport located at Centennial Mazda, 402 Mt. Edward Road, Charlottetown, PEI. We look forward to hearing from you – call us toll-free at 1 (877) 339-6031. 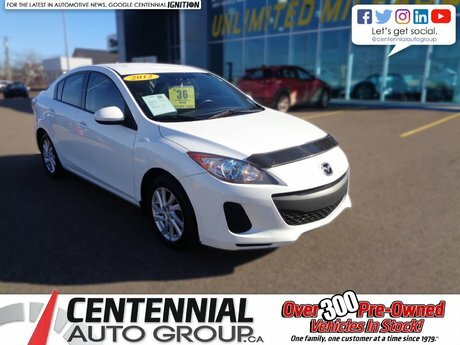 Interested by the 2013 Mazda Mazda3 GS SKYACTIV **AS LOW AS $47.00 WEEKLY PLUS TAXES** | **Financing available for almost all credit situations** ?